Virginia Overton, Untitled (Ham Chandelier), 2017, ham, rope, wood block, 31 x 13 x 5". Installation view. In 1987, Bay Area Conceptualist David Ireland focused a talk at the San Francisco Art Institute on Giacometti’s concept of the “disagreeable object,” a term the surrealist artist had used to refer to a group of his small, ugly sculptures that were meant to be thrown away. This new exhibition of Ireland’s work, along with astute interventions by Virginia Overton, considers the disagreeable object as a traveling, translated concept. The centerpiece is Ireland’s A Decade Document, Withcomet, Andcomet, Andstool, 1980–90, a post-Minimalist tribute to ten years worth of toilet paper tubes. But the show’s crucial language can be found in the many small concrete, potato-like untitled sculptures the artist has called “torpedoes”—his own version of the disagreeable object—that irregularly punctuate the space (including the ceilings) like exclamation marks. Hovering in a state somewhere between abstraction and mere detritus, they emphasize the inherently humorous failure of Ireland’s other makeshift, ramshackle sculptures here. 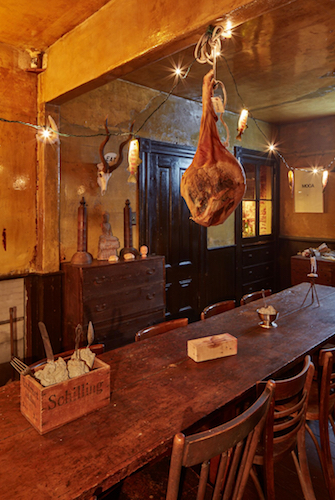 Within this conversation, Overton’s site-specific sculptures and installations add a subtly different flavor by affecting cartoonish awkwardness and impending disaster, as in Untitled (Ham Chandelier), 2017, a huge cured ham that hangs precariously in the dining room of the venue, and out on the roof is an untitled section of a wooden piling beam bisected by a sheet of Plexiglas, as though it fell from invisible window above. The positioning of the show at this site, where Ireland lived for decades and where much of his work and collections reside as well, deepens the intimacy of the conversation among the three artists.